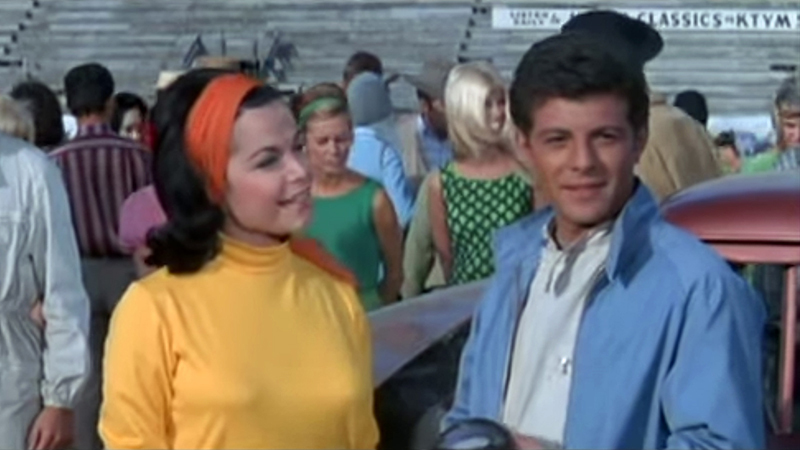 Bonelli House in "Fireball 500"
"Fireball 500" (American International Pictures 1966) with Frankie Avalon, Annette Funicello and Fabian shows the location of the Bonelli House. The movie was filmed at the Saugus Speedway and other Santa Clarita Valley locations (and elsewhere). The oval track surrounded a figure-8. The Speedway and the house were part of the Bonelli Ranch, owned and occupied by William G. Bonelli Jr. (Dec. 9, 1922 - Feb. 22, 1972) and his wife Joyce Bonelli (Aug. 30, 1923 - Apr. 15, 2001). William Jr. was the son of the "original" Bill Bonelli (1895-1970). As shown, the Spanish-style house stood just east (southeast) of the oval track of the Saugus Speedway. Today (2015) the location would be the southwest (west) corner of Soledad Canyon Road and Commuter Way, the access road to the Santa Clarita Metrolink Station. LW2811a-f: 9600 dpi jpegs from screenshots.